Yogis, it kills me that the most popular yoga class request I get is yoga for weight loss.. I'm all about self-improvement and setting goals, but it needs to be balanced with a MASSIVE dose of self-love!!! So many of my students struggle with body image issues and as they practice they constantly re-arrange their bodies and critique themselves. 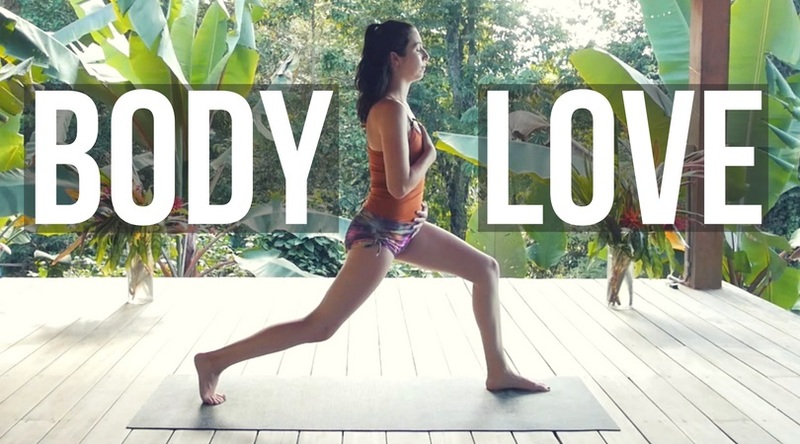 This is a 30 minute vinyasa flow practice to help you LOVE yourself and LOVE YOUR BODY. Every single inch of it! Every pound of fat, every wrinkle and every little bit of cellulite. I want yoga to be a refuge that you can turn to when you feel bad about yourself. Your yoga mat should be a place of solace where you don't need to worry about how you look or how much you weigh. In this practice we will use a lot of touch to learn to love ourselves and we will offer a deep prayer to women of the world. May we all learn to love our beautiful bodies that do so much for us. Cherish this vehicle that carries you through life, that births babies, that allows you to experience this world. This body that has done so much for you and has overcome even more! LOVE IT.